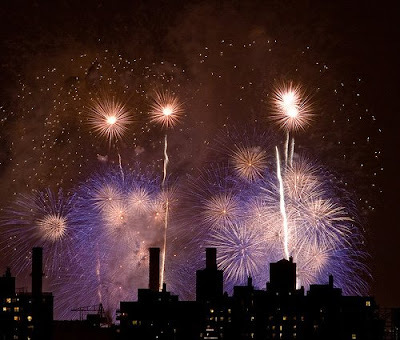 Ananka's Diary: Happy Fourth of July! Happy birthday, USA. It's raining in New York, which may put a damper on all of the fun. But if it ever stops, I'm going to walk over to the East River and check out the waterfalls that were recently constructed by artist Olafur Eliasson. Then I might eat a hot dog and launch my own homemade fireworks show from the roof of my building while belting out The Star Spangled Banner. Kidding. I don't even know all the words to The Star Spangled Banner. It's raining here in the Cincinnati area too. Oh well, my siblings will just have to postpone their own fireworks show. It's raining? I think this is the first time in a few years that is hasn't rained on Independence Day in my particular suburb. The waterfalls are very pretty. Too bad rain won't stop the people in my neighborhood who have a bit of an obsession with fireworks. Trust me, there is nothing worse than waking up to the sound of loud fireworks at one in the morning. so this is probably irrevelant..but I got this new history book from Barnes and Nobles...and learned of another amazing woman Hsi Kai in a time when women did not have many rights she was the most successfull pirate of all time and demanded her husband give her 50o percent of his wealth fr her hand in marriage! Oh my word, ducknamedchester! That is SO COOL! An unrelated thing - does anyone know if there is Kiki Strike fanfic out there? Another unrelated thing - I think there needs to be a forum of some kind for this site. Rain here in Washington to. It always rains here though. I don't know the words to the Star Spangled Banner either. I'm so happy I'm not the only one! AWWW! All of you guys are so lucky. Fireworks are ILLIGAL in CA. What's the fun in that? There are about two or three fireworks shows in my area, and not all of them are on the fourth. Sometimes there's an "encore" the day after. Fireworks are illegal in CA? Are they completely illegal? In IL, they're illegal for anyone except professionals. But people set 'em off anyway. Psh it was SO hot here today. I went to a parade and we stood there for like 2 hours just about to die. but I got lots of candy so it's all good. I would have gotten pics of the fireworks too, but someone got my camera wet, so now it's all weird. Ugh. nina, you live in NC? that's cool, me to. i pity all CA citezens... i love fireworks. and fire. hey I should do that! i love kiki strike it is my favorite book ever! not that that has anything to do with fireworks. but they are cool! Mae - Sparklers are not illegal. They arent even sorta illegal. They are completly legal. Just no fireworks.